The Pioneer after-market stereo in my GM car failed to eject a CD. I removed it and took it apart. The loading mechanism was beyond repair. I found a Pyle model PLR-26MPU car stereo, along with Metra installation kit 99-4000. This car stereo, like many of the newer ones, has an auxiliary input as well as an SD card slot and USB port. And, of course, an AM/FM radio for when the battery on the music player dies and needs charging with the USB port. Hey, who needs a CD player in the car anyway? This one has everything I need. 1) Remove the old stereo. This will differ on each car. Remove or pull away the dashboard trim piece from in front of the existing stereo. It may not need to come all the way out, just far enough to get at the old stereo mounting screws. Take care to save and label all fasteners for re-use on install. 2) Gather the parts. Three things are needed: 1) a stereo, 2) a wiring kit to fit the existing car factory wiring to the new stereo (I re-used the existing wiring someone else had installed with the Pioneer), and 3) a molded plastic mounting kit to fit the stereo exactly into the opening. 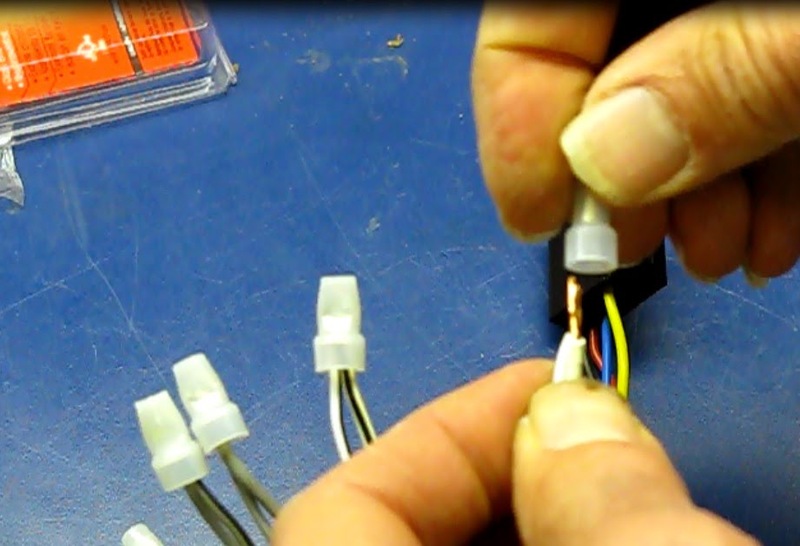 3) Wire your replacement stereo wiring to the kit that will mate with the car wiring. There should be instructions in the stereo kit that will show the function of each wire. Likewise, the wiring kit will have a chart showing each wire’s purpose. All you have to do is match them up, all eleven or twelve of them. The wire colors on the factory matching harness that went with the old Pioneer stereo exactly matched the Pyle wiring. I think a crimp fitting will hold up better in a car, where vibration and temperature extremes can challenge a connection. Yellow is the battery 12V responsible for the memory and red is the ignition switch. 4) Mount the new stereo to the mounting kit. A metal sleeve must be removed from the new stereo. It is held in by catches on either side. My stereo came with tools to release this catch and remove the sleeve. Generally a sleeve will be removed from the stereo and then slipped back on after the stereo is put in the mount. However, my sleeve was totally wrong for the Metra kit the Pyle stereo was to be installed into. I struggled for awhile to make it fit and then had to find another way to affix the stereo to the mounting kit. There were two holes in the plastic Metra housing that aligned with holes on either side of the stereo. I removed the cover from the Pyle to make sure the sheet metal screws I used would not hit any circuit boards or other parts inside the stereo. I used 1 ¼” long sheet metal screws. That made for a tight, secure mount in the Metra housing. 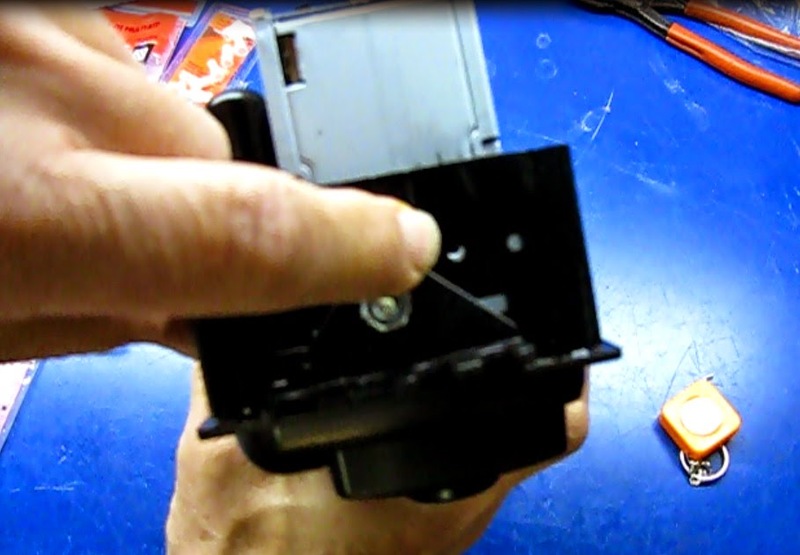 Run a sheet metal screw through a hole in the stereo housing that lines up with an existing hole in the stereo. 5 ) Fit the new stereo and mounting kit to the dashboard. These kits are designed to work with many makes and models of cars, so select the parts that will work with your vehicle. It is best to take the mounting kit to the car and check the fit before moving on to the next step. On the GM kit I used, two bolts and nuts fasten two brackets to the left and right of the stereo holder. These align with the factory mounting holes in the dash. In order for the stereo holder to fit in the dash opening I had to have the flush bolt head to the outside because the threaded end protruded too far to fit. These are the kinds of problems one normally encounters when mounting an aftermarket stereo in a vehicle. 6) Mount the stereo in the dash. First plug in the antenna cable and then the wiring harness. The existing stereo did not have a ground strap, so I didn’t worry about it. The ground connection on the tight-fitting antenna cable provides a good ground. Now mount with the two mounting screws in the dash. Remount the dash panel over the stereo. 7) Test all four channels for correct operation. Each and every part of our car is very important for us, therefore, we never miss any of the car products. The car stereo is also an essential car product, it boosts our driving experience through entertaining us. Nowadays in modern luxury cars, we have found new modern stereos which provide us better service. So instead of using the old stereo, we should replace it with a modern one. It is along these lines vital that lone top notch stereo speakers ought to be introduced in a vehicle to exploit a specific car's great acoustical structure.